Day two of the Bannisters Port Stephens Commodore’s Cup had an all-sorts look - beating sun, sudden heavy rain, bullets of 20 plus knots on the start line to barely any wind, lightning, a rainbow and dark clouds to the south as a southerly change loomed. The second of the three-race series wrapped up before a weather system sweeping up the New South Wales coastline reached Port Stephens. Overnight winds are forecast to reach 30 knots and bring storm activity to the Hunter coast. By the Wednesday lunchtime start of the closing Commodore’s Cup race, most of the southerly’s punch will be gone, leaving crews with a trailing 12-14 knots. Results for Tuesday’s inshore race have Warwick Miller’s Lumiere winning division 1 and leading the series scoresheet. Back in the mid-1990s Miller ran a successful big boat campaign with his RP66 Exile and following an extended break from the sport he’s back, enjoying his Beneteau First 50. Division 2 first place went to Rob Dawes’ Hanse 445 Indigo and division 3 to Rob Carr and Kerry Burke’s Northshore 370 Mortgage Choice Rumba, sailing for Middle Harbour Yacht Club in Sydney. “The course was excellent, challenging with 25 knots out of the north-west at the start and we had to keep worrying about the current,” Carr said. “It was nice to go past the islands and we had a lovely spinnaker run all the way to the finish line with the crew sitting on the back quarter keeping the rudder in the water. Geerit Veenemans’ Royal Queensland Yacht Squadron based Fareast 28R, both the boat and class name, scooped top spot in division 4 to also lead the series, the tightest of the five Commodore’s Cup divisions with the first three boats sitting on equal points and split by a countback. Peter Mayo’s Sydney 38 Austral from the Royal Motor Yacht Club Toronto beat the rest of the non-spinnaker division on corrected time and sits in second overall with one race to go, two points behind Jim Thomas’ Botany Access Cocomo, a Sydney 36. 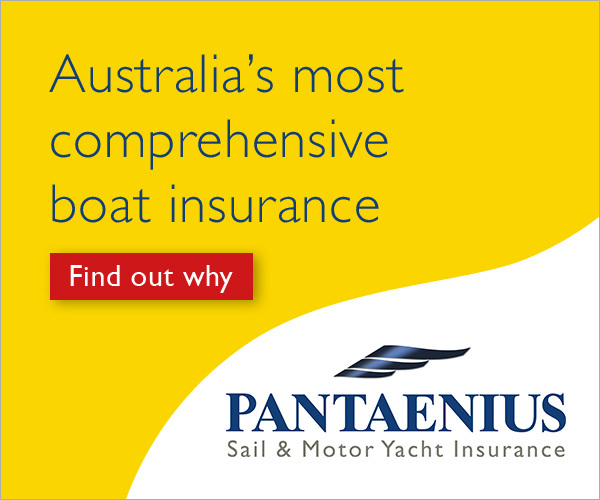 Thursday April 11 is the dedicated Sail Port Stephens layday for the keelboat crews before the annual series’ second half – the Pantaenius Yacht Insurance Port Stephens Trophy commences, bringing a bunch of fresh competitors to Nelson Bay to vie for a number of state and national titles April 12 – 14. The weekend long-range forecast indicates light winds. Saturday is set to deliver the most challenging conditions to the 145 entries, another Sail Port Stephens record fleet coming on top of the record Commodore’s Cup fleet of 100.